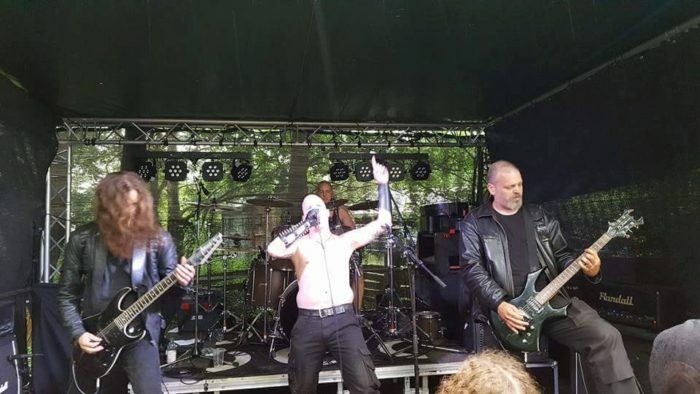 Kaeck have posted a live video of “De heerser wederkeert” off of Death Metal Underground’s 2015 Album of the Year Stormkult from their performance at the Under the Black Sun 2016 festival in Germany. Regrettably, Oovenmeester (also in Noordelingen) was unable to provide his unhinged vocals so Ygethmor from Standvast provided more somewhat more conventional and staid black metal vocals somewhat too high in the mix for a ringer. The live version is still worth checking out in order to hear Chaos from Sammath‘s haunting guitar work in a less distorted live setting. Kaeck feat. Pilsbury Doughboy on guest vocals. They could roast him on an open fire and distribute the pieces to the audience as culmination of the performance. If they “cross the streams” on him after the set when he passes out drunk, will he explode into hot sticky goo? I want a girl with a short skirt and a loooooooooooooooooooooooooong jacket. Good grief, that was truly awful as are this band. No bass could be understood, but where is the keyboard player! ?